Bus from Ipoh to Butterworth is one the effective transportation option to travel between Ipoh and Butterworth. Travellers prefer bus over train and flight are due certain reasons. First, there is no direct flight from Ipoh to Butterworth. Moreover, with limited train schedules daily, travellers much prefer to take bus than train. Kesatuan Express, Cepat Express, Konsortium and Unititi Express are bus operators offering bus service from Ipoh to Butterworth. These bus operators, combined, have up to 13 daily trips. Kesatuan Express is the largest bus service provider among others by having up to 6 daily departures from Ipoh to Butterworth. Among the players, Kesatuan Express and Konsortium are the only two operators supplying VIP coach with spacious for this route. Both Cepat Express and Unititi Express are operating the service with 40-seater coach. The earliest departure goes at 12:25pm. The last bus leaves the boarding point at 5:30pm. 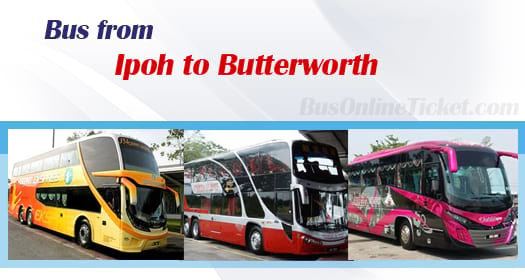 In between, there are vast number of bus services from Ipoh to Butterworth. The time it takes to travel from Ipoh to Butterworth is about 2.5 hours by bus. The duration for bus from Ipoh to Butterworth is estimated based on the road traffic condition. Washroom break will be given upon request from the driver during the journey. The bus fare from Ipoh to Butterworth is costs in a range of RM 15.30 to RM 20.00 depending on your selection of bus operator. Cepat Express is the only operator offering child fare at RM 11.50. The pick-up point in Ipoh is located at Aman Jaya Bus Terminal. Passengers who is living in Ipoh city could easily access to Aman Jaya Bus Terminal by taking city bus or taxi from Ipoh city centre. The drop off point in Butterworth is located at Penang Sentral Bus Terminal. Booking bus ticket online from Ipoh to Butterworth with BusOnlineTicket.com is simpler than we think. Upon payment is successful, email confirmation will be sent to your email to confirm your seat reservation. Booking bus ticket online with BusOnlineTicket.com would ensure your transportation before travelling.